Yesterday I sampled a section of Rockstar Games’ upcoming western at their New York City headquarters, a location game-previewing press haven’t had much reason to visit in the last half decade. There, I hoped to finally get a feel for the mega-studio’s first new game since 2013’s Grand Theft Auto V. It’s out soon, just a little over a month from now on PS4 and Xbox One. My demo started with a Rockstar rep at the controls, showing me an early mission involving a train robbery. It was straightforward in execution but technically astounding, seamlessly switching from richly detailed exterior action, like a scramble across the top of the moving train to richly detailed interiors, such as when the gang was able to scour a cabin car’s furniture for an important document. In Red Dead Redemption 2, players control a committed outlaw named Arthur Morgan. He’s an early recruit into the Van der Linde gang, a crew of nearly two dozen outlaws and oddballs. Their members include a younger version of Red Dead Redemption protagonist John Marston and his wife and son, Abigail and Jack. According to a Rockstar rep in the room, they’re all pursuing the dream of living free from the constraints of civilization, on the run and gradually travelling east after a botched robbery. The gang appears to be one of the things in the game Rockstar is most proud of, as they recently devoted a one day Twitter blitz to promo shots of its many members. 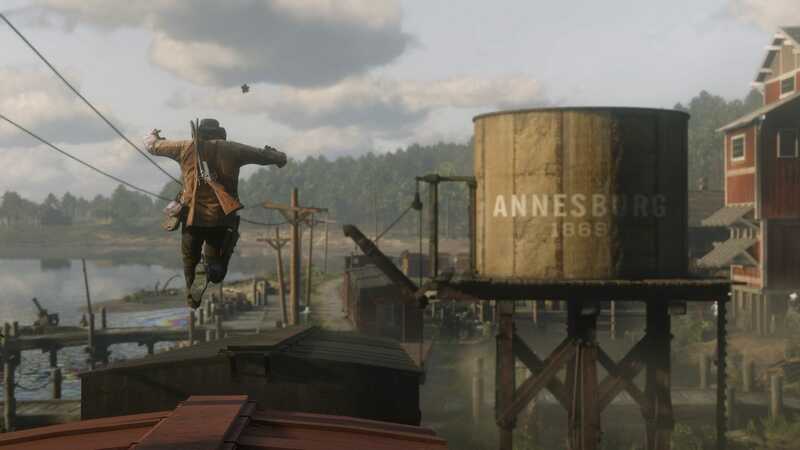 As you play, the gang will set up camp at various spots across Red Dead Redemption 2’s five-state map. They’ll move at various points in the story and will apparently operate as Morgan’s hub for resources and interaction throughout. I took control of Morgan far away from the camp on a sunny hillside, where Rockstar’s reps deemed it wisest for me to get a feel for the game’s controls. He was easy enough to get to walk around, particularly given that I’ve played one of these games before. Walk around with one analogue stick, control the camera with the other. Tap X to move faster. Jump with square. Maybe it was time to go hunting? I spotted some crows and used the game’s slow-mo Deadeye shooting system to rip off several shots. Turned out the lead from my bullets in their carcasses rendered them nearly worthless. It’s weird how impressed I was, and how we can fetishise guns so much in video games, but the gun details in the game are noticeable and admirable. Morgan loads each bullet into the chamber one by one. When he’s done with his gun, a double tap of a shoulder button makes him twirl it before holstering it. Some of the systems I saw in action were new twists on older ideas. The detail that Morgan can gain and lose weight depending on how much he eats is a throwback to GTA San Andreas. The Honour meter, which reflects Morgan’s reputation, is a variation of the morality meter in the previous Red Dead. 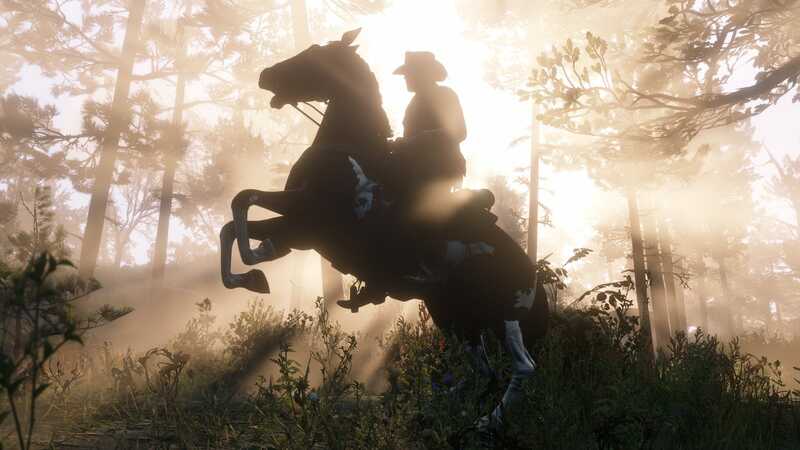 Rockstar promises subtle effects in how characters react to you and with better payouts for robberies if you play more dishonourably, and higher payouts for chasing down bounties if you play more honourably. In my demo, I was hearing about how Morgan’s hair and beard will grow over time and then went to a barber where I could get a trim (only reductive trims and shaves possible; you can’t suddenly add a huge mop of hair). 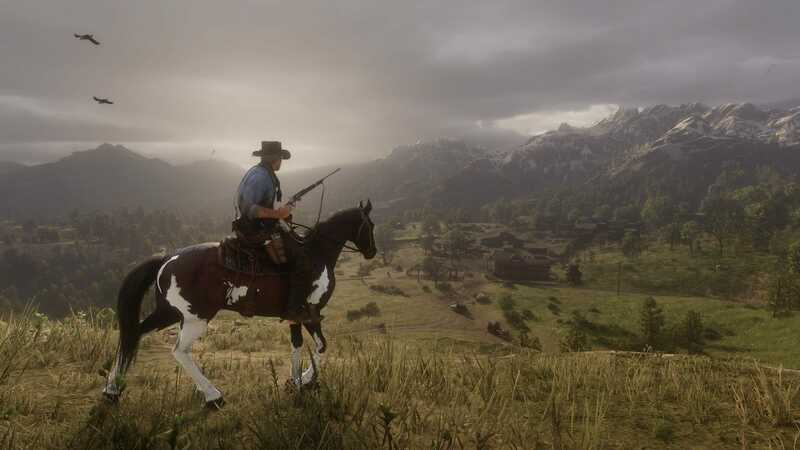 I marvelled at how real the characters’ clothes looked—actually worn, not painted on—then heard from Rockstar that clothing can be layered and that players can even choose to wear an outfit with the sleeves rolled up or down. I was told that horses come in various breeds, and that you can bond with them and learn new skills, like a dramatic skid-stop or a dressage side-step. After seeing the game’s first trailer, we and other had wondered if the horse’s testicles were animated. I asked, and they told me that the testicles shrink and expand depending on the temperature in the game world. Details, details. While I was in town, I had Morgan order a drink, take on a bounty from a sheriff, agree to a sidequest to track down outlaws and attempt to take a bath. I checked the flexibility of the system for interacting with townspeople and realised I could vary my interactions with people. I chose to antagonize two men in a bar, for example, and nearly started a fight. Then I chose a more positive interaction option to de-escalate the conflict and walk away untouched. Later, we went to the base camp, which was full of people and points of interaction. One woman told Morgan about what sounded like a new mission. Two other women nearby started chatting about a massacre and a curse and asked him his thoughts. “You believe in curses, Arthur?” one of them asked. “No, I believe in bullets and not too much else,” he replied. “You soulless wretch,” she retorted. A Rockstar rep said that wouldn’t have happened if Morgan hadn’t lingered in front of them. Near a campfire, he could pour a hot drink. A notice on screen indicated that a character in the camp makes stew daily. 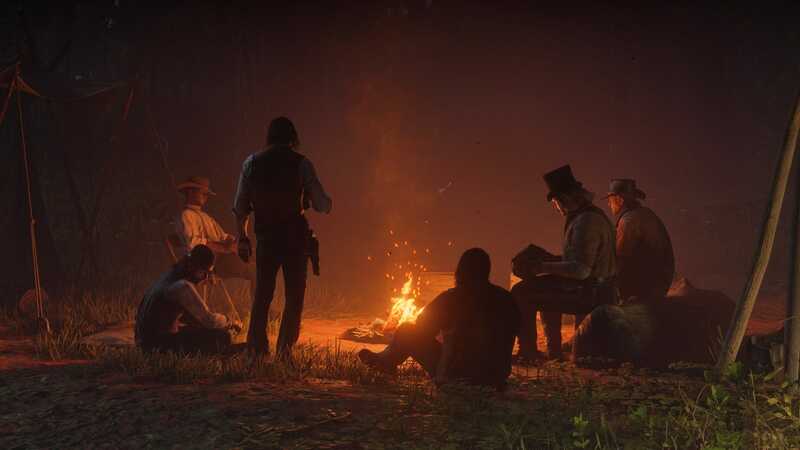 At every possible moment, Rockstar would talk about the importance of the gang and their camp, and nearly as often they’d point out that it is not compulsory to do anything with the gang or their camp. Presumably, they don’t want people to feel like the Van der Linde gang is a crew of Roman Bellics, channelling the worst of GTA IV’s overly needy cousin. 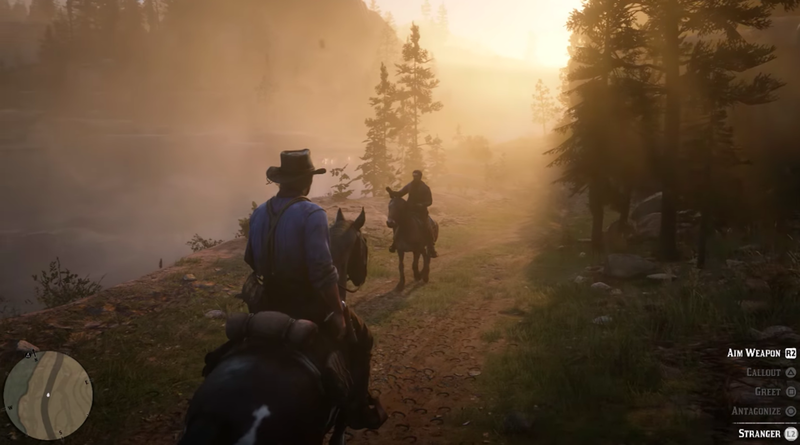 Rockstar indicated that, yes, you can provide money and provisions for the camp and upgrade it, and that you can wind up in more meaningful conversations with other members of the game along the way. They say that helping the camp out will expand the types of activities gang members will go on with you and will affect the stories told around the campfire. But you don’t have to. 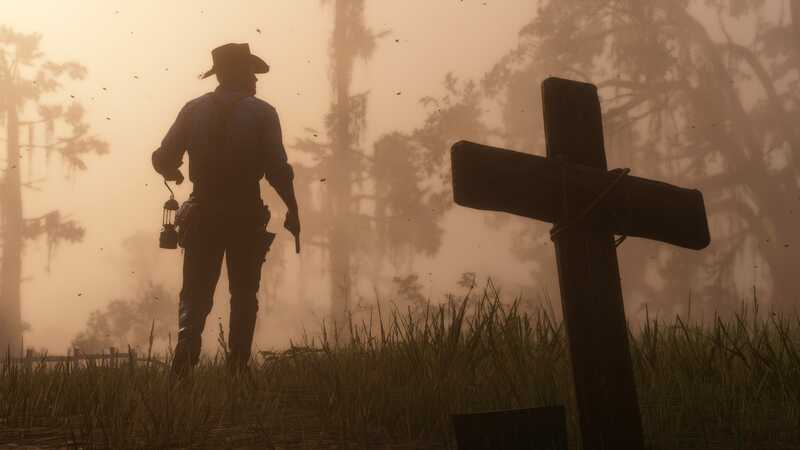 If nothing else, camp appears to offer the chance to hang around John Marston some more, which is a treat for those who enjoyed his gravelly drawl in the last game. Game previews are a glimpse at the top of an iceberg. I’m told there’s stuff beyond the mountains. I’m told the map is enormous, spanning five fictional states that represent the types of topography seen across the United States. There’s even a big city, the say, the likes of which the franchise has not previously seen. I’m told the story is ambitious. I can’t tell. It just wasn’t possible to see.